You can sing about the Itsy Bitsy (Eensy Weensy) Spider. 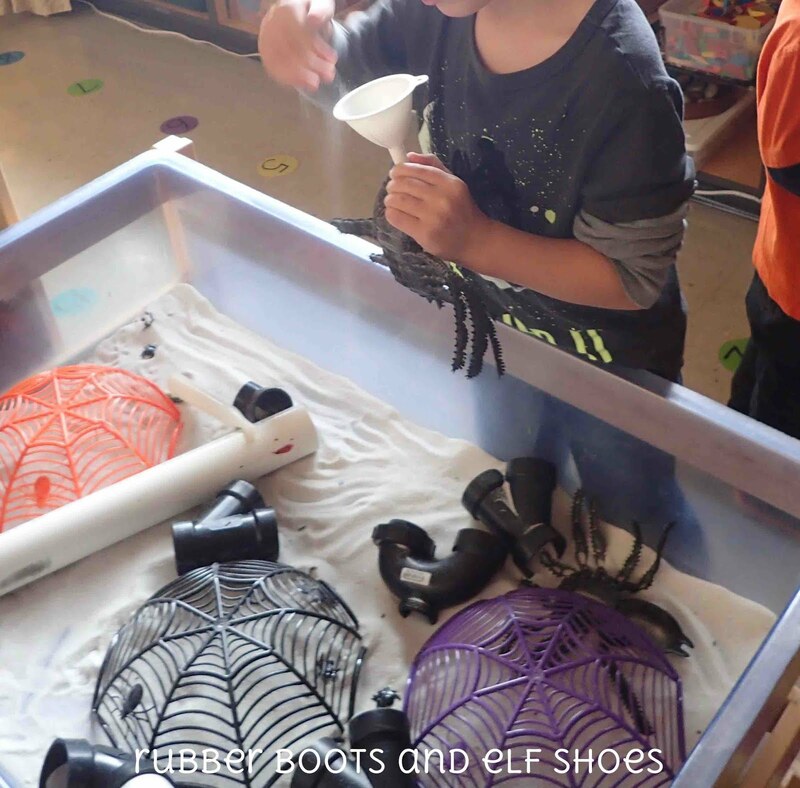 You can make play dough spiders, handprint spiders, toilet roll spiders, egg carton spiders, even display supercuts printables. 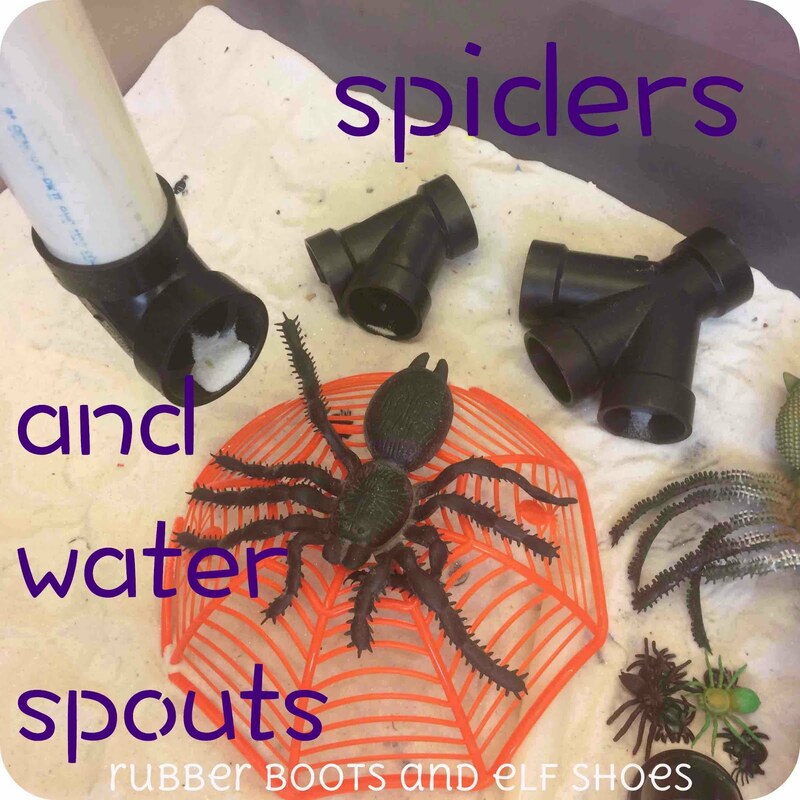 We like to do all those things - aaaaand we like to add some waterspouts, and some science exploration to our spider fun. 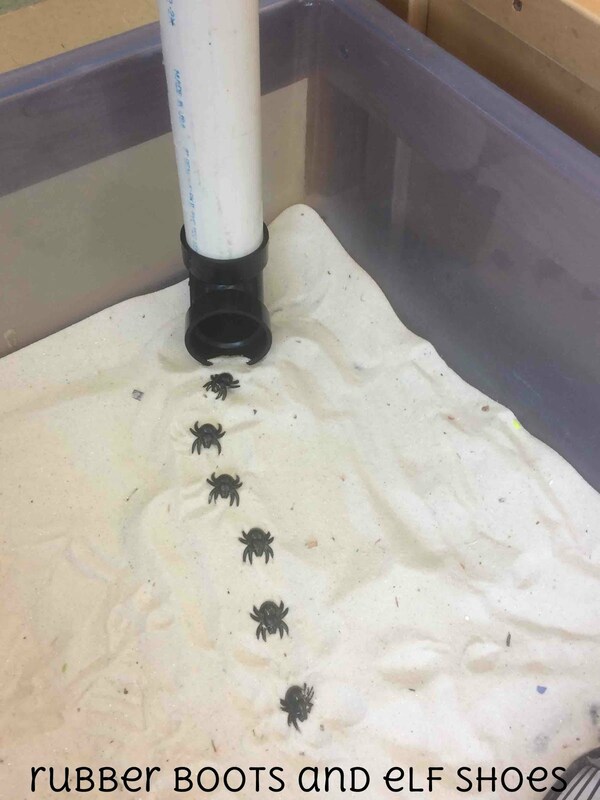 Since we are in the northern hemisphere, and spider time is in the fall, and the weather is getting a bit chillier, our spiders encounter sand rather than water in the water spout. 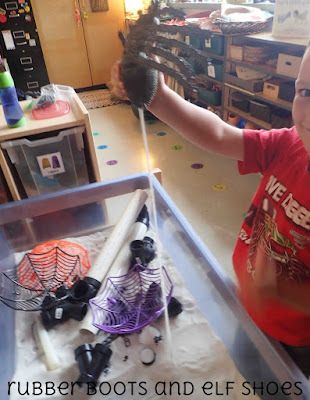 Luckily for us, the exploration and learning works as well with sand as water. And we stay a lot warmer and drier. For the spider to go adventuring in the waterspout - you need a waterspout. I use PVC piping from my local hardware store. 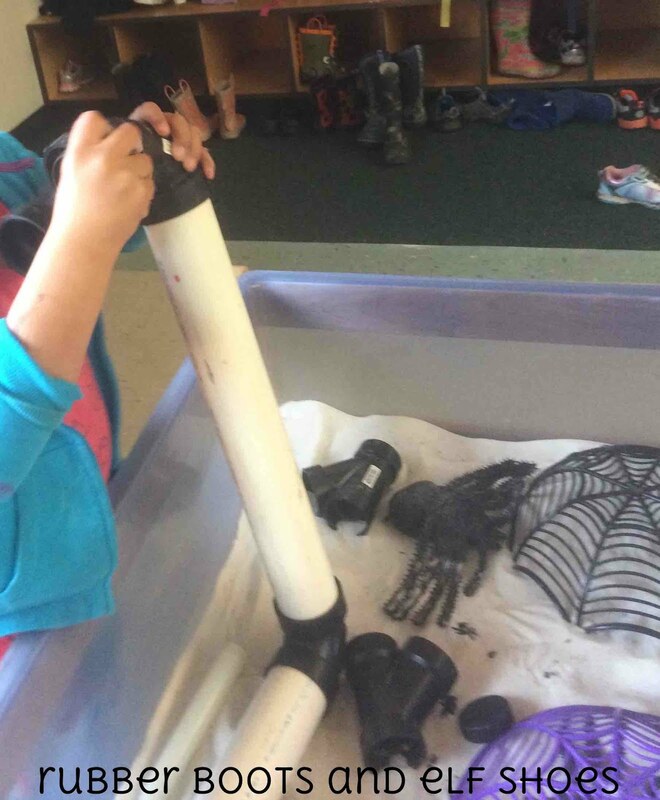 (Yes, I know about the danger of PVC piping; I tell the children that kindergarten kids do NOT lick PVC pipes.) The fun part is all the connectors. While I was at the hardware store checking out all the 3" connectors, the nice hardware store man asked me if I needed any help. I explained the project as he gradually stepped backwards and let me know that I was probably doing fine without his assistance. Poor man. No scope for the imagination. We have a variety of spiders. Big, little and in between. 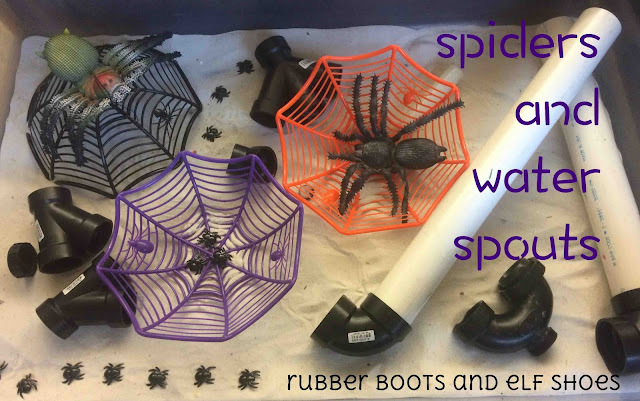 Common variety dollar store spiders. A few extra bits and pieces rounds out the exploration equipment. 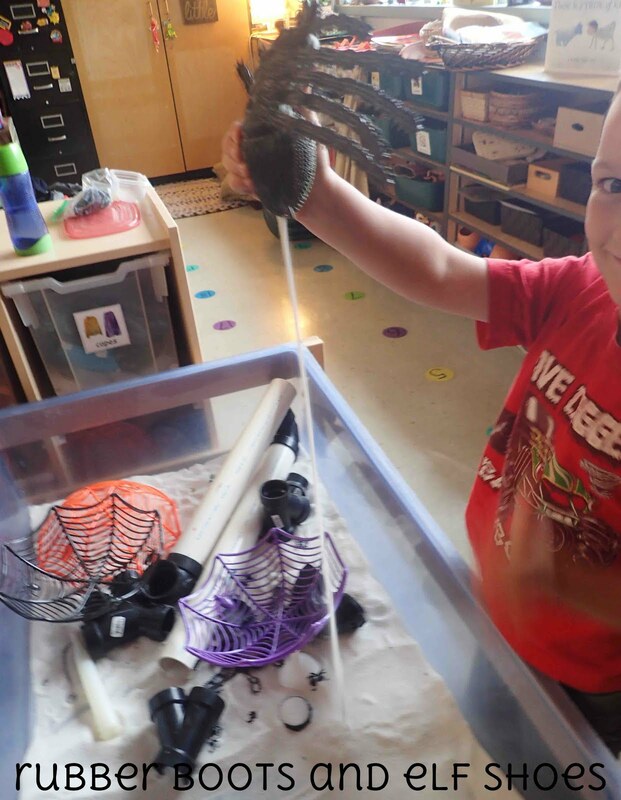 The funnels and the plastic tube part of a turkey baster are standard equipment in the sand table. If I take them out, the kids let me hear their displeasure. The PVC pipes and connectors are excellent tools for exploring the physics of angles and velocity. 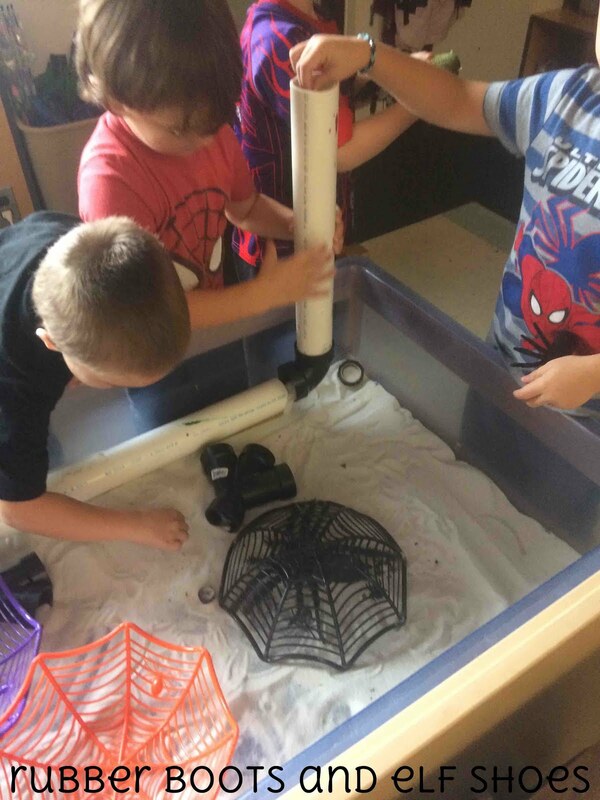 What angles are necessary for the spiders to come out of the spout? What happens when the PVC pipe turns 90 degrees. What happens when the PVC pipe has a 45 degree angle. Does the kind of spider make a difference in going down the water spout? 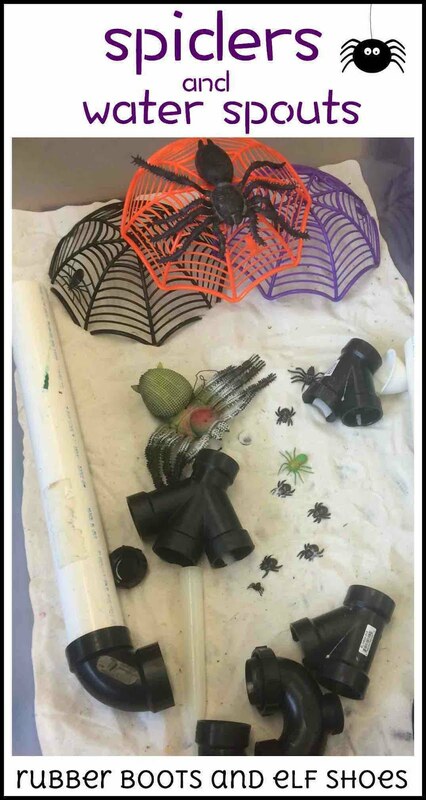 The dollar store spider bowls provide spider "homes" that seem to be the necessary item to instigate spider stories. Spider homes. Spider families. Big spiders. Little spiders. Lots of fodder for spider stories. and then let the "silk" stream out. 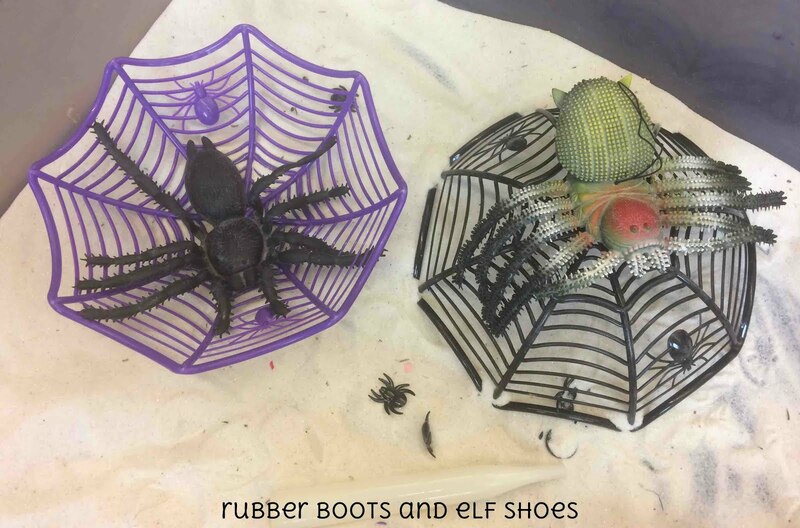 Itsy bitsy, eensy weensy, and great big spiders - and a variety of water spouts - a great way to extend the traditional nursery rhyme. The water spouts are brilliant!